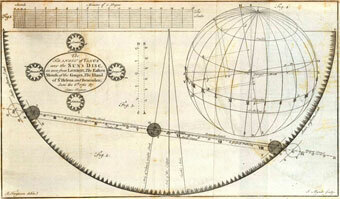 There is hardly any mention of the 1761 and 1769 transits of Venus in the chronicles of the general news media. This event was known only to the astronomical community, and there is little information that apparently made it into the popular press and daily newspapers. In fact, newspapers were still not very common so news didn't travel quite the same way as it does today! The little news about the transit of Venus that did appear was entirely of a technical nature, reporting sketches of the path of Venus across the sun disk, and the ingress and egress times. The sketches often looked like this one in Figure 1 by James Ferguson of the June 6, 1761 transit. "June 10. Please insert in your next paper the following scheme of the transit of Venus over the sun as observed at Kings College on the 3rd [of June] which will oblige your most humble servant Robert Harpur." Figure 1 - Illustration from James Ferguson's book Astronomy Explained. Still, although the 1761 and 1769 transits didn't leave much of an impression in the popular literature, historians believe these events did not come and go without leaving in their wake a number of subtle but important changes in the way that American 'pre-Revolutionary' science was conducted, or even regarded on the international scene. It's hard to believe that figures and measurements like the one above could elevate a Nation to the stature of a scientific 'player' in the international arena, but that seems to be just what these observations did. "Conceptual changes in science were accompanied by a radical revision of possible roles for scientists; the growth of full-time professionalism made it increasingly difficult to be an amateur. Perhaps the last major occasion on which the advance of knowledge was seen to depend on the contributions of the amateur was the observation of the Transit of Venus in 1769. That observation was, as Donald Fleming has remarked, "the symbolic act of allegiance to science and learning". Those who observed the transits and made measurements may have been amateurs, but they were not casual ones. In Providence, Joseph Brown spent nearly one hundred pounds sterling on a telescope and other equipment; he and Benjamin West accomplished the delicate, demanding task of calibrating the instruments. West was primarily a bookseller and almanac maker, but he had a serious interest in mathematics, and his reports of the transit are sophisticated. By the end of the century, however, it was less likely that part-time participants could make contributions to knowledge. the 'characteristic home of the American scientist' shifted from the private laboratory or privately organized observations .. to the college." The impact of these transits on the average American was, however, not really made clear until the next pair of transits in 1874 and 1882. Many domestic newspapers went to great trouble to run detailed articles on the progress of various scientific expeditions to distant lands. "All scientific men, and all others who are sufficiently informed to respect scientific pursuits, will be rejoiced at the news that the transit of Venus has been successfully observed at several stations. Fortunately the preparations for this great event were so complete that failure was scarcely possible"
By the 1882 transit, a far more rousing burst of interest seem to have been unleashed. This sense of 'cosmic adventure' was infectious and caused many columnists and reporters to wax poetic on these exotic events. Although articles tended to take up huge amounts of space to report the details of the measurements (as though the average citizen understood what these numbers meant! ), occasionally articles would appear that captured some of the sense of excitement during these events. In one of these accounts from the San Francisco Chronicle (December 6, 1882) one can almost hear the voice of Mark Twain! "Why the astronomical community should be so exercised over a planet's movements; why their emotions should culminate when a shadow impinges upon or fades from the solar substance; why the transit of the planet should be called apparent; why Professor This should perch himself upon a pile of volcanic rocks in the Southern Pacific and Professor That shiver in the snows of Siberia to pry into an orbital incident happening millions of miles from either - these or something like them, are questions which the untutored many might wish to put to the erudite few." Here is a list of newspaper articles dealing with the Transits of Venus between 1761 and 1882. Click on the link to download the PDF file. What possible political impact could such a strange astronomical event have? Plenty! The 1769 transit of Venus is regarded by some historians as the pivotal event that thrust American scientists into the international limelight. We made our very first contribution to science and scientific discovery a decade before the Revolutionary War, when the British and French were the recognized masters of science and discovery. "...inspired the Americans to try harder in the effort to gain cultural recognition overseas. 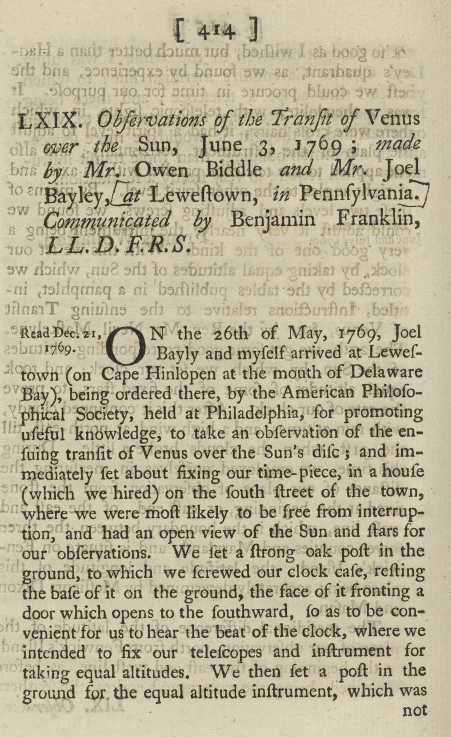 The Americans responded with what amounted to national pride when a number of European astronomers complimented them on their astronomical observations in the transit of Venus in 1769. Some Americans, like Franklin, even used their provinciality as a device for winning attention and recognition. Franklin liked to present himself as the simple no-nonsense American whose canny mind, untainted by European 'artificiality' and 'luxury' , remained nimble and free of the self-delusion excessive civilization encourages. Although London was not overly impressed with this act, it played well in Paris. Cultural provinciality was a handicap that clearly was not without its compensations"
Not wishing to be left behind in the international exploration, but without a domestic scientific journal, early American scientists were forced to publish what observations they could make in European journals. Foremost of these was the prestigious British publication, Philosophical Transactions of the Royal Society. 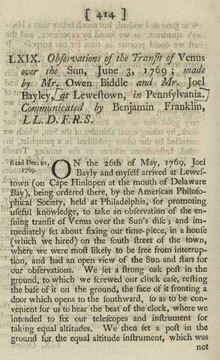 It would be Benjamin Franklin, one of the members of the U.S. Continental Congress, who offered to sponsor the publication of the measurements by Owen Biddle and Joel Bayley published in the 1769 issue. American science remained fairly low-key until March 6, 1872 when a petition was received in the Senate by Mr. Cameron of the Philosophical Society of Pennsylvania, requested that Congress set aside $50,000 to enable American astronomers to observe the transit of the planet Venus across the sun's disk in December, 1874. This petition was referred to the Joint Committee on the Library, and on April 12, 1872 Senate Bill 963 was passed to appropriate $50,000 to equip US Naval Observatory professors with instruments to observe transit. For the next transit in 1874, Congress allocated $75,000 for international scientific expeditions. It would be the first transit for which the United States would be a full participant in the many international expeditions that were set out to observe and study it. Prof Newcomb, the Director of the US Naval Observatory in Washington DC soon became one of the most famous American astronomers of the 19th century. Prof Newcomb was put in charge of reducing the observations for the 1882 transit, but none of the data was ever published. He had a very frustrating time dealing with the US Treasury, who constantly moved his funds around and changed their amount so that he was always firing and re-appointing his staff over the ensuing decade. A professional competition eventually developed between Newcomb and William Harkness, with both coming to the same decision about the distance from Earth to the sun, but Newcomb eventually won based largely on his popularity and acumen as an astronomer. During a single second, the sun converts 4 million tons of matter into pure energy.